Social determinants of health are not just about soft skills and the promise of helping patients by better understanding their individual circumstances any more. Rather, there’s a legitimate business case to be made — and it’s a powerful one. Exactly how big is the opportunity when you start to look at overall spending? And what does the data coming out of successful social determinants initiatives reveal? 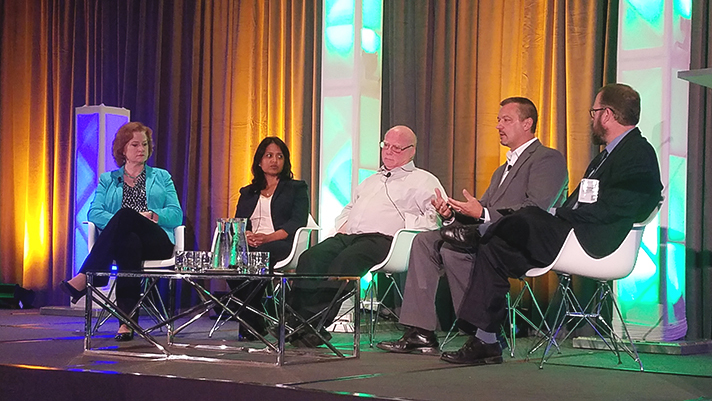 I got a sense of certain bits and pieces that tease at answers to those questions at the HIMSS and Healthcare IT News Pop Health Forum in Chicago last week. Experts presented a range of data points that, when taken together, create a glimpse of just how enormous the opportunities hospitals and health insurance companies actually have. That’s not to say it’s as easy as slapping social determinants into the EHR and then watching while that $1.7 trillion starts shrinking, of course. But providers including NorthShore University Health System and ShoreQuality Partners, as well as Humana on the payer side, are already harnessing social determinants and achieving demonstrable results. Roy Beveridge, MD, speaking at the Pop Health Forum in Chicago on Oct. 3. Roy Beveridge, MD, did the math. As the chief medical officer of Humana, Beveridge said that by 2050 America will have 83.7 million seniors and that three in four citizens over 65 years old have multiple chronic conditions. What’s more, 10,000 people are enrolling in Medicare every day. As part of its Bold Goal initiative to improve the health of members 20 percent by 2020, Humana wanted to entice its doctors to ask about social determinants by not looking at whether patients had diabetes or hypertension but, instead, homing in on one issue specifically: food insecurity. The payer found that people who are food insecure are 50 percent more likely to be diabetic, 14 percent more likely to have hypertension and 60 percent more likely to experience heart failure. That seems bleak but it also presents an opportunity. Humana’s research indicates preventing early chronic diseases, for instances, can reduce spending by 34 percent, eradicating unnecessary services can eliminate 14 percent of costs and providing better care at home instead of in hospitals can save 30 percent. Wait, there’s more. Treating unmanaged behavioral health issues can slash costs by 60 percent, Beveridge added. Still concentrating on food insecurity, Humana screened 369 members, found that about half qualified, then offered them SNAP benefits and an emergency food box. Beveridge said that cut the number of days those patients were either physically or mentally not well in half. And with every unhealthy day costing $15.64, the per member per month cost across the country can really add up. Before I get carried away here, the hard reality is that the healthcare industry will not prevent chronic conditions thoroughly enough to kill that $1.7 trillion dollars anytime soon — but some providers are chipping away at costs after their own fashion. Cliff Frank speaking at the forum on Oct. 2. Shore Quality Partners, in Somers Point, New Jersey, was spending $2,800 a member a month in 2015 and did not earn any savings. So it turned its focus to better making use of the social determinants among diabetic patients — including providing non-billable services that ultimately reduce costs. “We have the ability to figure out what kinds of issues patients are having, including transportation and somebody to watch the kids,” said Cliff Frank, Shore Quality’s executive director. Shore Quality, in fact, placed social workers in high-volume Medicaid practices to address such problems as they arise when patients show up but, of course, the problem in many cases is that patients often do not even come into appointments. Read more Innovation Pulse colums from Healthcare IT News. Shore Quality has a fund that doctors can tap to send Uber drivers to pick up patients unable to make it into the office. Frank sad that if patients accept the offer of a hospital-paid ride 500 times a year, that would be a lot — and that patients usually turn it down but it does stimulate them to come into the office on their own terms. That is one example of where providing non-billable services has actually paid off for Shore Quality. An even more important tactic is in treating complex patients with multiple complicating factors. When people who don’t regularly show up for appointments do present, Frank said doctors want to do everything they can since there’s no way to know if that person will be back, or when. And that often consumes closer to an hour than the typical 15-minute visit. “We’re going to make sure high-risk patients get services essentially free. It’s not free to us, but it is to them,” Frank added. Those non-billable services can pay off, too. Shore Quality, in fact, reduced its admission rate among diabetics from 68 per thousand to 42 per thousand. Along the way, Frank learned that patients will be more compliant if providers make the services accessible. When a diabetic educational session was held at Frank’s office, for instance, the no-show rate was 40 percent but that dropped to 20 percent when it took place in the doctor’s office. Smita Patel, DO, from NorthShore’s Neurological Institute, presenting study findings on Alzheimer’s disease at the Pop Health Forum in Chicago Oct. 2. While Shore Quality is succeeding treating diabetic populations, NorthShore University Health in Chicago is looking into the future of Alzheimer’s disease. Alzheimer’s now costs $236 billion, Patel said, but if the country continues at this current pace it will reach closer to $1.4 trillion by 2050. Patel pointed to midlife obesity and hypertension as known factors for developing dementia, as well as lack of sleep which can impact diabetes and glucose tolerance, thereby serving as indirect risks for Alzheimer’s. The list of determinants decreasing the risk comprises years of formal education, moderate alcohol consumption, social engagement and physical activity. Patel recounted results from a two-year study looking at 1,260 at-risk adults, average age of 69 years old, to manage that risk through interventions consisting of diet, exercise, cognitive performance and social engagement from baseline to month two that saw a 25 percent to 150 percent improvement among the control group. So NorthShore did just that by putting risk factors into a format, creating a brain health quiz and giving access to ultimately create a primary prevention model designed to determine who’s at risk, what NorthShore can do about it, and how to get into a clinic. Underpinning today’s success stories is the fact that making use of social determinants to reduce costs and improve care requires both cultural and technological change. Patel said that America’s healthcare system excels at fighting infections, treating HIV, keeping patients alive and now needs to turn toward keeping baby boomers alive in a “healthyish” way as they live longer. That won’t be easy. But harnessing social determinants can help — and, indeed, move toward the Triple Aim of better patient care that creates healthier population at a lower cost. Because 86 percent of spending is related to chronic conditions, according to Tiffany McCauley, a nurse and clinical executive at Elsevier, and social determinants have an impact on 60 percent of outcomes. Our next event is the Big Data and Healthcare Analytics Forum in Boston on Oct. 23 to 24. I hope to see you there.